Cloudflare is a global leader in web security, providing protection against Denial of Service, SQL Injection, and other kinds of attacks. Speedyrails has partnered with Cloudflare to offer protection for your website or application. Speedyrails customers receive a 25% discount on Cloudflare's Pro and Business plans. Managed hosting customers receive additional discounts when using Cloudflare. From the Speedyrails Manager, click Services > Cloudflare. Click the checkbox to agree. After adding your first domain, the organization's owner will receive a confirmation token and link to confirm the account and set an account password. 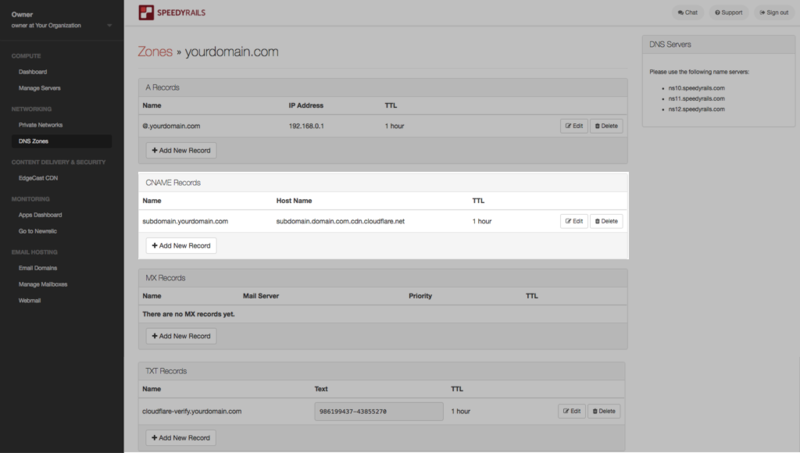 The Cloudflare user account manages all domains added through the Speedyrails Manager. Cloudflare's knowledge base provides further instructions for managing your Firewall, Page Rules, and more. You can learn more about the Pro plan on the Cloudflare web site. You can learn more about the Business plan on the Cloudflare web site. The Enterprise plan is available for organizations requiring enterprise-grade security, performance, and guaranteed uptime. Contact us for more information. To configure your domain to work with Cloudflare, you will require access to your domain's DNS records. Full DNS protection requires that you use Cloudflare's name servers. Cloudflare's name servers will replace your default name servers, which protects your entire domain and all related subdomains. You can find your Cloudflare name servers on your Cloudflare Overview section. Log in to your DNS provider. Change your name servers to the name servers provided on the domain overview section of your Cloudflare account. Submit changes to your domain. Confirm the change in your Cloudflare dashboard. CNAME protection applies to specific subdomains (CNAMEs) on your root domain. Your subdomain will use a CNAME record to point to Cloudflare, but this does not require you to change your DNS name servers. To do this, you must verify your domain with Cloudflare using a TXT record. You can find your Cloudflare verification record on your Cloudflare Overview section. Add a TXT record to your root DNS record with the name and content provided in the overview section of your Cloudflare dashboard. Submit the changes to your domain. Wait for Cloudflare to verify your domain. Log into the Cloudflare dashboard. Click DNS to open the DNS menu. Add a CNAME or A record to point to the subdomain on the origin server (e.g. subdomain.yourdomain.com). In your DNS provider, create a CNAME record to point to your subdomain on Cloudflare (e.g. subdomain.yourdomain.cdn.cloudflare.net). CNAME protection does not apply to a root domain. To protect a root domain you must use Full DNS Protection.